The two lead roles have been announced for Bill Kenwright's new tour of The Sound of Music which opens at the Bord Gais Energy Theatre in Dublin on 19th December. Lucy O'Byrne will star as Maria, having performed the role in the previous tour. 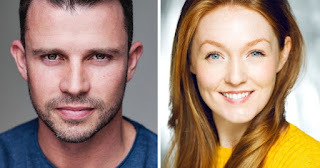 She will be joined by EastEnders actor Neil McDermott as Captain von Trapp. O'Byrne wss a runner up in The Voice on BBC One in 2015. Since leaving the 2016 tour of The Sound of Music she has played Fantine in Les Miserables in the West End. McDermott's is best known for portraying Ryan Malloy in the BBC television soap opera EastEnders. His musical theatre roles include Chief Weasel in The Wind in the Willows and Lord Farquaad in Shrek.